Normandy Life: Italy in Books Reading Challenge with Book After Book. Italy in Books Reading Challenge with Book After Book. I love the connectivity that occurs between bloggers, don't you? Two months ago I joined like minded, book reading bloggers for the monthly What We're Reading linky party and have added quite a few more titles to my TBR list since then. LindyLouMac paid Normandy Life a visit after reading my review of Fall On Your Knees by Ann-Marie MacDonald last week. The Italy In Books Reading Challenge hosted every month by Brighton Blogger @ Book After Book. It caught my eye because I recently read and enjoyed "Summer School" by Domenica de Rosa, I'll be reviewing the book soon, and linking it to the Challenge, in May. There are a few other books on my shelves that will fit this challenge too and I know that I'll find plenty more next week when I'll be visiting the revered and hallowed "Book Town" of Hay on Wye in Herefordshire, UK. Sadly we won't be there for the Festival of Literature and The Arts but I do hope that I'll get there one day. A great idea, Maggie. I'm going to check those out! Hope you had a lovely Easter! Hi Maggie, I am afraid I don't often sit still long enough to read a book although I have recently read "The Girl in the Painted Caravan: Memories of a Romany Childhood" Eva Petulengro and have passed it on to my very pregnant daughter who read it in three days as she enjoyed it so much. I have bought two books today while out shopping, Susan Boyle "The woman I was born to be" and Margaret Powell " Below Stairs" so I had better get reading!!! I know you recommended "A redbird Christmas" about 18 months ago and I read that quite quickly and enjoyed it. Perhaps I should join a book club to make me read more. I am sure you will buy some lots of books at Hay on Wye with all their bookshops.Supermarkets always have bargains, the two I bought were 2 for £8.00 instead of the full price of £14.98!! Maggie, I appreciate your participation in our What We're Reading Linky Party. My "to be read" pile is increasing, too! I am hoping I can read several of them this summer at the lake. I usually have more time to read during the school year because carpool is a long, drawn-out affair! Keep the good books posts coming!!! Thanks for the recommendation and the new party recommendation. Enjoy your visit to Hay on Wye, Maggie. I checked the link and would love to see it one day. I have a bookshelf lined with books about Italy now and am counting down the days until my trip. We'll have two home bases and plan to make lots of day train trips in the month. I think that the connections between make blog hopping like having a conversation in a group of friends. 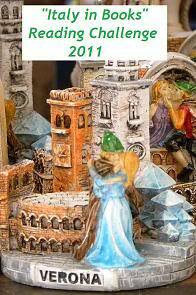 I am delighted that thanks to discovering my blog you have decided to join the Italy in Books Reading Challenge Maggie.